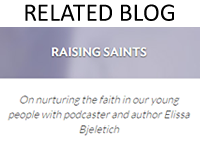 How do we as Orthodox parents keep our children in the Church throughout their lives? It all begins with involving them in the life of the Church from birth onward—in the parish and also at home. Blueprints for the Little Church provides practical ideas and encouragement—without judgment—for incorporating the primary practices of Orthodox spirituality into your family life at every stage of its growth and throughout the church year. 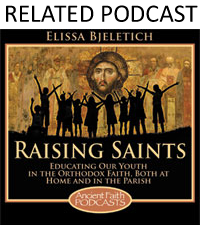 Elissa Bjeletich hosts the popular Ancient Faith Radio podcast, Raising Saints: Educating Our Youth in the Orthodox Faith, Both at Home and in the Parish. She is the author of In God’s Hands: A Mother’s Journey through Her Infant’s Critical Illness (Ancient Faith Publishing, 2013) and the Sunday school director at Transfiguration Greek Orthodox Church. She lives near Austin, Texas, with her husband, Marko, and their five daughters. Caleb Shoemaker is the father of four children. A graduate of Gordon College with a BA in Youth Ministries and an MA in Biblical Languages from Gordon-Conwell Theological Seminary, Caleb has worked in church and parachurch ministry for seventeen years. He and his wife Emily converted to Orthodoxy in 2012. He blogs very sporadically about the importance of bringing the life of the church and the life of the family together at www.calebshoemaker.com. This is his first book.